EVEN AFTER seven decades, the American bombing of Hiroshima and Nagasaki generates controversy. President Obama's planned visit to the Hiroshima Peace Memorial next week is sure to revive once more the debate over Harry Truman's decision to drop the atomic bombs that destroyed the two Japanese cities, killing 200,000 people and forcing Japan's unconditional surrender. Ben Rhodes, Obama's deputy national security adviser, let it be known on Tuesday that the president "will not revisit the decision to use the atomic bomb at the end of World War II." But perhaps Obama should "revisit" that decision — not to apologize for it, but to reaffirm that it was right and just, ultimately saving countless lives, ending a terrible war, and freeing the people of Japan from a savage and fanatic regime. "We are now prepared to obliterate more rapidly and completely every productive enterprise the Japanese have above ground in any city. We shall destroy their docks, their factories, and their communications. Let there be no mistake; we shall completely destroy Japan's power to make war." In a Gallup poll that month, an overwhelming 85 percent of Americans supported the bombings. It was universally understood that the only alternative to the atomic bomb was an invasion of the Japanese homeland. US military strategists were planning a two-part offensive: The first, on the southern island of Kyushu, was scheduled for Nov. 1 and would require an invasion force of 770,000 American troops — five times the number of Allied soldiers who landed at Normandy on D-Day. The second invasion, on Japan's main island of Honshu, would begin the following March, sending another million and a half men into an inferno from which hundreds of thousands would never return. In Goodbye, Darkness, his memoir of the war in the Pacific, where he had fought (and been severely wounded) as a young Marine, the famed historian William Manchester expressed the prevailing reaction among Americans to news of Hiroshima's destruction. "You think of the lives which would have been lost in an invasion of Japan's home islands — a staggering number of Americans but millions more of Japanese — and you thank God for the atomic bomb." 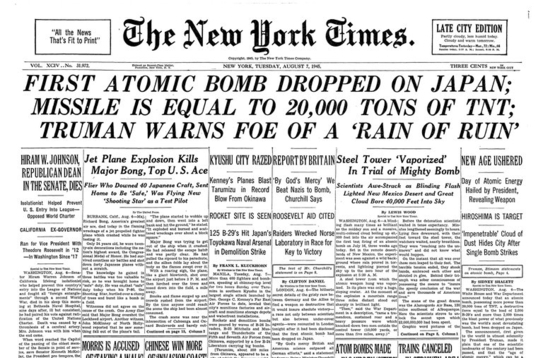 Those heartfelt words of gratitude — "Thank God for the atomic bomb" — later became the title of a celebrated essay by the literary critic Paul Fussel, another veteran of the war. Like everyone else at the time, he regarded the bomb as a blessed reprieve from a death sentence. When he and his comrades learned what the atomic bomb had done to Hiroshima and Nagasaki, "we broke down and cried with relief and joy," Fussel recollected. "We were going to live. We were going to grow to adulthood after all." In recent decades it has become fashionable in some circles to condemn the bombings as a great moral evil — a "flagrant crime against humanity," as the British academic Akil Awan wrote in the New Statesman last year. Some revisionist historians have claimed that Japan, which by mid-1945 was badly losing the Pacific war, would have been forced to surrender even if atomic weapons hadn't been used. Others have decried the bombs' ghastly human toll. Tens of thousands of civilians were killed by heat and pressure so intense that it scorched their shadows into walls and streets; tens of thousands more died later from radiation sickness and injuries. But it isn't news that war is hell. And it isn't clear why dying in an atomic blast is worse than dying in a "conventional" firebombing, such as the nighttime raid on Tokyo in March 1945 that burned up a fifth of the city with napalm and killed 105,000 people, mostly civilians. What was clear, then and now, is that Japan's military forces were expected to fight to the death. In a futile attempt to defend a strategically unimportant speck of an island called Iwo Jima, the Japanese had killed nearly 7,000 US personnel and wounded 19,000 more. Nearly every one of the Japanese on that island, some 18,000, had died fighting. In Okinawa, a few weeks later, the carnage was even more intense. More than 12,000 American servicemen lost their lives; Japanese deaths surpassed a mind-boggling 100,000. Yet Iwo Jima and Okinawa were merely an overture to the butchery Americans could expect when they invaded Japan itself. For Truman to have prolonged the war by refusing to deploy the new atomic weapon, letting the fighting grind on for weeks or months and thereby condemning myriads of Allied soldiers and sailors — and Japanese — to die would have been unforgivable. By all accounts, he never considered not using the A-bomb, nor ever had qualms about his decision. The atomic devastation that forced Japan's surrender and ended World War II made possible the emergence of a strong, productive, and eunduring friendship between Japan and the United States. The atomic bombings gave the peace faction within Japan's government the opening it needed to prevail over the death-before-surrender militarists who refused to end a war they knew they could not win. The destruction of Hiroshima and Nagasaki, though horrific, was "a golden opportunity given by heaven for Japan to end the war," said Hisatsune Sakomizu, the chief cabinet secretary in the Tokyo government. And the end of the war, in turn, proved to be a golden opportunity for the victorious Allies to transform Japan's perception of itself and its role in the world. A country that had inflicted unspeakable brutality and suffering throughout Asia was transformed into a bulwark of democracy, freedom, and stability. The cruel and dictatorial government that, with Hitler's Germany, had plunged the world into a cataclysm was shocked by the bomb into abandoning its ethos of war. Vanquished, Japan was forced to adopt a new constitution renouncing "forever" the right to resort to war; it did so wholeheartedly, embracing a new identity as a pacifist nation — and becoming, in the process, one of America's closest and most reliable friends in Asia. 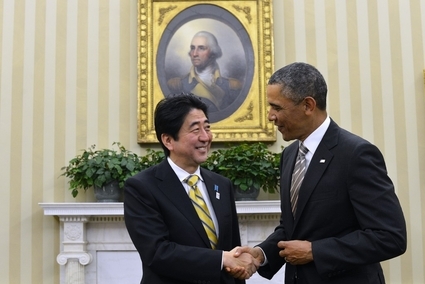 That friendship, now nearly 70 years old, is well worth celebrating during Obama's visit to Japan next week. So is the decision by his great Democratic predecessor Harry Truman, who didn't flinch from deploying a fearsome new weapon, and in so doing achieved much good.